I recently discovered a new feature on Facebook which allows you to see just how long you’re spending on the addictive app. I co-admin the NHM Facebook group so I was expecting it to be quite high, but I’ve also made a conscious effort to reduce my time on the app as much as possible to spend quality time with the family when I get it. My oldest son has noticed just how much I’m not on my phone, perhaps because he has to help me find it when I continuously lose it, but I was super proud when that happened. Less time on Facebook means that I probably check my news feed once a week and I generally ‘miss out’ on a lot of my friend’s posts. But you know what, this has almost been a good thing. I find I’m making an effort to pick up the phone and CALL friends to catch up on what is happening instead of just staying abreast of everything online. So imagine my surprise when my stats came back saying that I have spent an average of 51 minutes a day using the app in the last week! No way! Anyway, check it out guys because it tells you your breakdown of each day in the last week so you can see what your popular FB days are. Luckily for me in my quest to pull back, the weekends are my lowest. 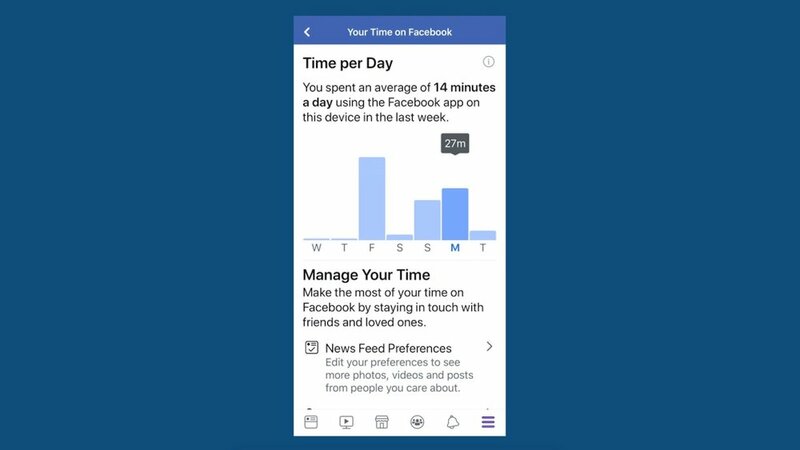 From this feature you can also edit your news feed preferences to see more photos, and posts from those you want to and here’s the best bit, you can set a daily reminder once you’ve reached the time that you’ve allocated yourself on Facebook each day. How cool is that!